A new feature from American Express lets you pay down purchases one at a time with your smartphone — and might help you save money on interest in the process. The issuer has announced that it will roll out an a la carte payment option on several of its U.S. consumer credit cards and co-branded cards starting Aug. 30. The feature, called Pay It Plan It, gives cardholders the option to pay off small purchases right away (Pay It), or pay down large purchases over time by setting up an interest-free installment plan for a monthly fee (Plan It). For those who carry balances, the latter option could potentially add up to big savings. Log in to your AmEx Mobile app. If you don’t already have it, you can download it for free on your iPhone or Android device. You can also access the Plan It feature by visiting the American Express website. See what purchases are eligible. 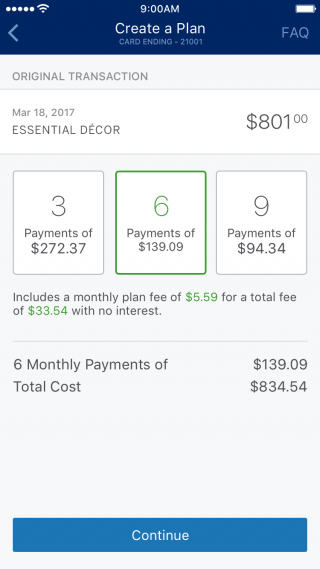 In your app, you’ll see icons that say “Pay It” for purchases under $100 and “Plan It” next to purchases over $100. Some transactions can’t be paid with this feature. More on that later. For Pay It transactions: Click on the Pay It icon. If you have multiple banking accounts on file, you can decide which one to use. Press “Pay” to complete the transaction. At that point, you’ll see a pending payment notification on your balances. The payment will take up to 48 hours to be reflected in your outstanding balances. 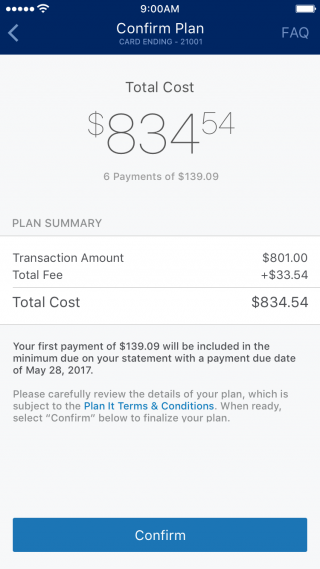 For Plan It transactions: Click the Plan It icon, then click “Create a Plan.” From there, you can choose from up to three installment plan options, which can vary by customer. (See images below.) In lieu of interest, you’ll have to pay a small monthly fee which varies based on your credit card’s APR. If your card has an APR of 14.99%, for example, you’d pay a monthly fee of up to 0.66% of each purchase. This would generally save you money compared with paying the regular APR. Once you confirm your plan option, your next payment on the plan will be added to your “minimum due” payment on your next bill. Keep in mind, you can still pay your bill all the usual ways — such as online with autopay or by mailing in a check. This feature just gives you additional options. The feature is not currently available for all American Express cards. AmEx debuted Pay It Plan It for most of its consumer credit cards. However, as of this writing, the feature isn’t available for consumer charge cards, or cards that need to be paid in full each month (such as The Platinum Card® from American Express), or AmEx small-business credit cards. You can’t use Pay It Plan It for all credit card transactions. Some transactions that aren’t eligible for the Pay It Plan It feature include purchases subject to foreign transaction fees, purchases of cash equivalents (say, cash advances) and fees charged by American Express, such as annual fees on your credit card. There’s a daily limit to how many payments you can make. You can make up to five payments per day, including payments from every device, according to American Express. If you want to pay off more than those five purchases in a day, consider making one larger payment instead of several small ones. Here’s how you can use Pay It Plan It to your advantage. Use Plan It if you’re expecting to incur interest on a major purchase. Plan It is almost always going to be cheaper than paying interest on a major purchase, despite the monthly fees. If you pay your balance off early, you won’t have to pay future monthly fees. However, if you have an active 0% purchase APR offer, paying down your balances over time without Plan It would likely be cheaper. Use Pay It if you’re trying to keep balances low. If you’re flying too close to your limit, using Pay It regularly for small purchases — or, alternatively, just making additional payments throughout the billing cycle — can help you keep your balances low. Bringing those balances down could have a positive effect on your credit score. Images courtesy of American Express.